North Korea leader Kim Jong-un. Photo: Pyeongyang Press Corps/Pool/Getty Images. 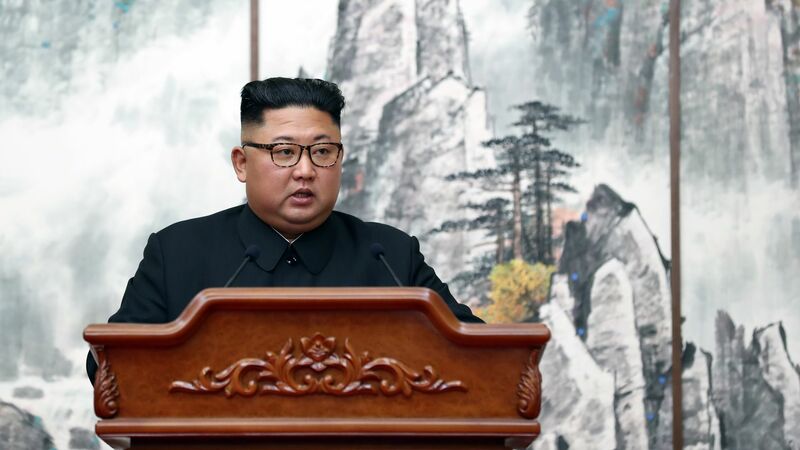 Despite diplomatic efforts by the U.S., new satellite images show that North Korea has expanded an unidentified long-range missile base along the "mountainous interior of the country," CNN's Zachary Cohen reports. Why it matters: The construction does not technically violate any agreement between the U.S. and South Korea, per CNN. However, the activity shown from the images is more evidence that the Yeongjeo-dong missile base and a nearby site remain active, leading the Trump administration to conclude that Pyongyang has failed to live up to its promises. The details: The images show the country was building a large underground facility in 2017, which was still under construction as of August. In November, satellite imaging revealed North Korea had been making improvements to 16 hidden ballistic missile bases even as it has made halting moves to dismantle a major site to appease the U.S.
Secretary of State Mike Pompeo met Kim in Pyongyang in October to prove that the Punggye-ri nuclear test site had been "irreversibly dismantled." What to watch: National security adviser John Bolton said Tuesday that Trump wants to hold a second summit meeting early next year with North Korea even though Kim has not met promises to start dismantling his nuclear weapons program.